Rachel | Living life in the carpool lane..
M is getting to an age where she wants a pet. Unfortunately, M is allergic to cats and Hubby is allergic to dogs. I like animals, but I get really nervous having to hold them or take care of them. Malia likes lizards, but there is NO WAY I can be in the same room with one. Fish! A pet fish is what we have to settle for. We went to Petco in order to see all that we need to get a pet fish into our home. We went to Petco to see what fish were available and how much money we could be possibly spending. After talking to the associate, he told us that a good starter pet fish would be a beta fish. After hearing that, we went to the beta fish section and looked at all the items we would need and all the different beta fish were available. After looking to every possible thing we could about beta fish, the girls wanted to explore the store for other animals. Birds. We found birds. 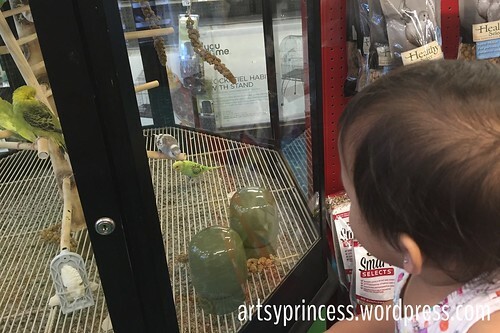 The girls loved the birds. They loved listening to their tweeting. K loved tweeting back in response. It was so cute watching her just stare at the all the cute birds. I’m sure if I told them they could take a bird home, they would jump at the chance to have one. So this is where we are…. We are at the “I want a pet” phase of life. It’s going to be interesting. I just hope she outgrows her cat allergy and pray that neither girl will develop a dog allergy! 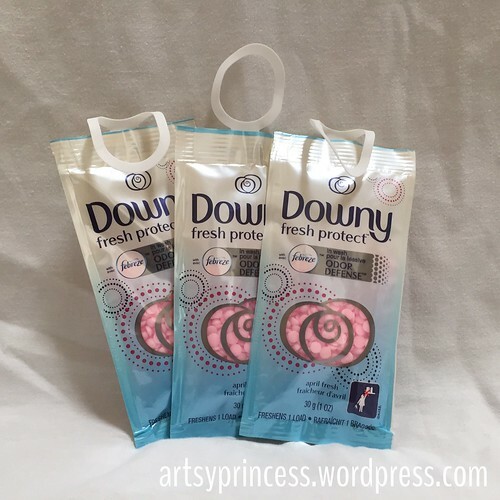 I received these pouches of Downy Fresh Protect Beads in my Influenster Goddess Voxbox. We make our own laundry detergent (click here). We don’t any sort of beads that make our laundry have any particular smell. Putting these beads into our laundry was a good change. One pouch is good for one load. I put the clothing into the washing machine and poured the contents of the pouch onto the top of it. I didn’t add any extra fabric softener because I wasn’t sure if it was going to clash with the scent in the product. Our laundry came out smelling so fresh and clean. 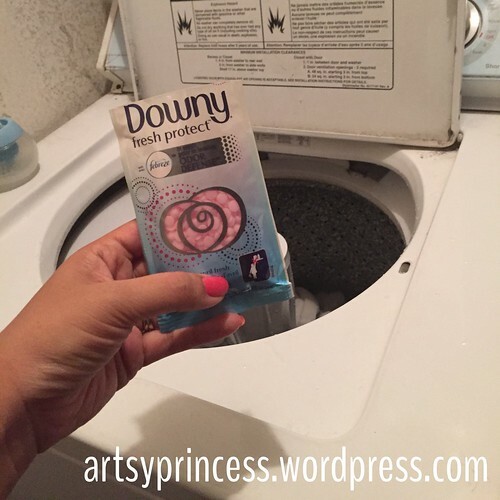 I really liked the scent of the beads BEFORE I put them into the wash, so I was expecting to enjoy the way they would make our laundry smell. Overall, it’s a good product. It’s easy to use, and my clothes came out smelling nicely. There really isn’t anything else to comment on. I do recommend this to others. 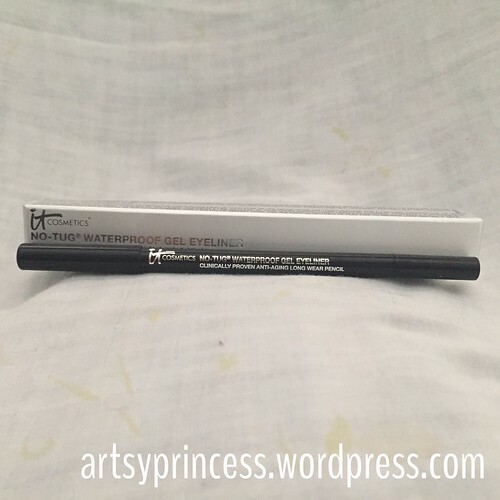 Fine print: I received these products complimentary from Influenster for testing purposes. I did not pay to receive them, nor will I be paid to review them. This year, M is working on some summer crafts. We went to Walmart and purchased art supplies. While browsing, we came across all the DIY craft kits and stumbled up on this wind chime kit. It’s about $9.99 before taxes. Paint your own windchime. M really wanted it. I knew this would be a perfect project that I could take a few days to complete. The kit comes with a wind chime already assembled. 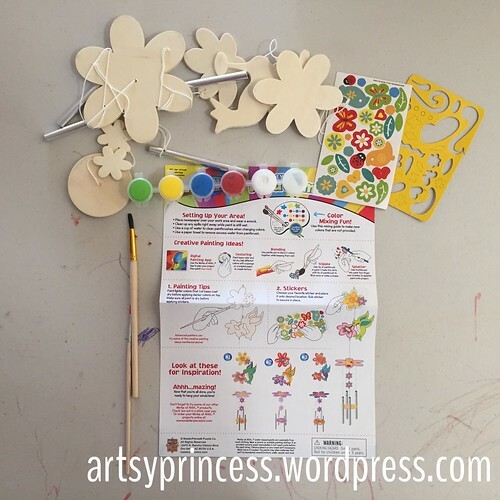 Paints, paint brushes, stickers and stencils come with the kit. 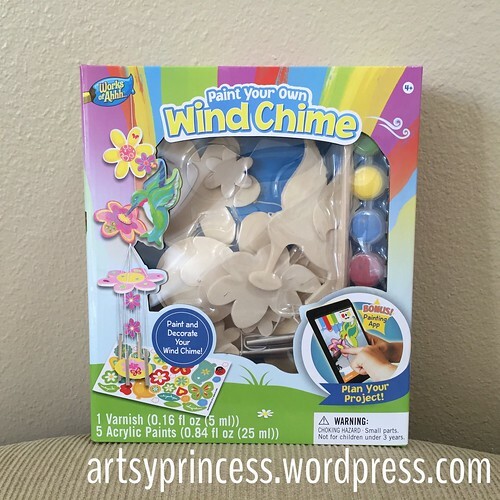 There is also a paper with suggestions on how to paint the wind chime. We didn’t need those. M was going to paint it her own way. The wind chime is currently a ‘work in progress.’ It’s been about two days worth of work so far and I’m expecting another two to three days more before it’s completed. She’s having a blast painting it and asks about it all the time. Unfortunately, we usually have to wait for K to be napping for her to do this. If K was awake, all she’d want to do is get involved. It would be messy and a bit frustrating for M who just wants to take her time and do a good job. Thank goodness M is really understanding about waiting. 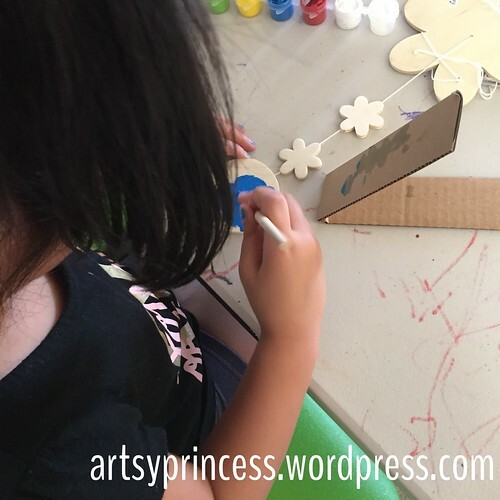 I can’t wait to show you the finished wind chime! The girls love playing in my closet. They love hiding in my clothes. M says she’s a shirt whenever she hides inside. 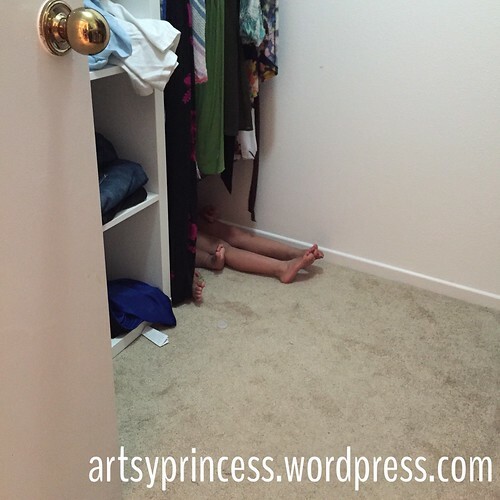 K loves hiding around just like her sister. That photo above? Well, they’re being shoes! Duh! Thank goodness for a clean closet, right? Remember when i said I have a new obsession/addiciton to makeup? 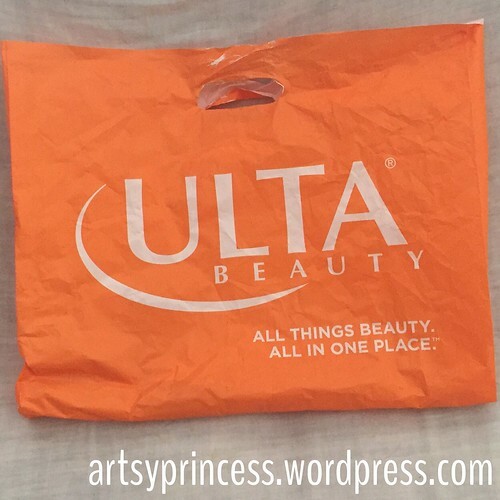 I recently went to Ulta (third time in a month) and purchased a few new items to add to my stash. Yes, I’m doing a ‘haul’ post. I don’t have an active Youtube channel to post to. Just let me have my obsession. On our vacation, I had forgotten my moisturizer and had to use my mother’s. This is what she was using. 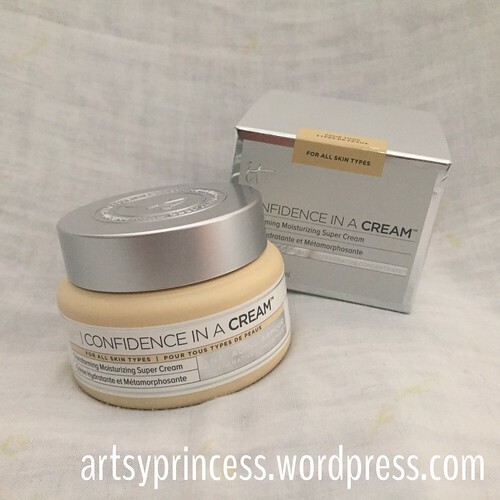 I used it everyday for about five days and started to notice differences in my skin. My skin was much more hydrated. Make up was gliding on so much better. My skin was getting smoother. I was definitely noticing changes. So when we got home, I ran to Ulta and purchased one jar for myself. I had been eyeing this for awhile. 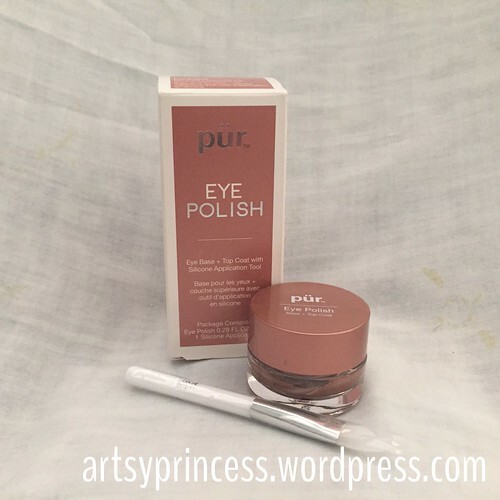 I tried it on my first trip to Ulta and fell in love. It’s a liquid shimmery eyeshadow. After falling in love with it that first trip, I went online to watch what beauty vloggers had to say. Everyone had rave reviews of this and I knew I had to have it. I’m happy with the product and I’m itching to go back and get more! I ran out of eyeliner and needed to buy more. I was using an Eyeliner from Buxom, but decided to change things up. Since my mother introduced me to It Costmetics, the brand has been my go-to. I decided to try the eyeliner. I’m so glad I made that choice because this eyeliner glides like butter. Seriously. I spent a little over $120 with this haul, that’s including tax. It’s been a few weeks since I purchased all these items. I’m very satisfied and happy with all of them! Any make up recommendations? Leave them in the comment below! Fine print: I purchased all these items myself, with my money. I was not paid to purchase them and I was not paid to post about them. K adores M. There are times when K just watches whatever M is doing. She just observes her big sisters actions. Then suddenly, she’s trying to do the same thing. It could be a small action. M was touching her tooth one morning. K was just observing. Suddenly, K starts touching her touching her tooth in the exact same way M was. It could be big actions. M was jumping around and dancing to a song on the television. Without any hesitation, K got up, jumped and danced around like her sister. K learned how to ‘freeze dance’ just by playing with her sister. We use the songs already loaded on our electronic keyboard. When I turn the volume all the way down, the dancers freeze. When the music comes back up, they dance. It’s so funny watching the girls ‘freeze dance’ because K usually follows whatever frozen pose M finds herself in. It’s very cute. That picture above? That’s at Costco. M was leaning forward and kicking the shopping card behind her. It took K awhile to figure out how to drape herself over the cart handle. I had to show her to put her arms over to prevent her from hitting her head on the cart. 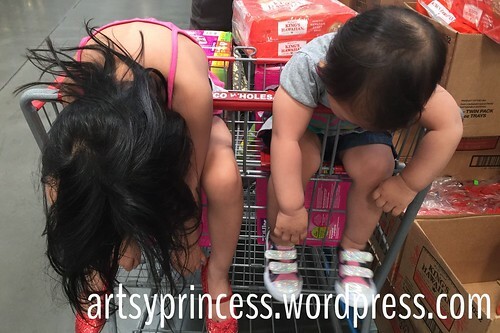 However, once she got it, she was trying her best to get her little feet and legs to reach that back of the cart like her sister.